The ‘November 2016 Bar exam results’, conducted by Supreme Court (SC) of the Philippines, Office of the Bar Confidant are released on May 3, 2017 (Wednesday), few months after the last day of exams. 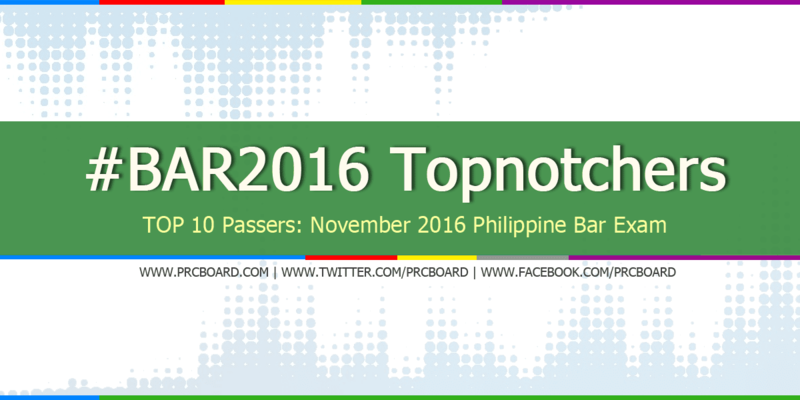 Aside from the official list of passers, the top 10 lawyers are also posted. Karen Mae L. Calam from University of San Carlos ranked first in the exams garnering 89.05% rating. She was followed by Alanna Gayle Ashley B. Khio from Silliman University having 88.95%. Below is the complete list of 2016 top 10 examinees as released by SC. While netizens and examinees are asking about the possible release date of results, as mentioned in the main page of this article, it will be out on May 3, 2017 (Wednesday) at 11:30 AM. PRCboard.com is among the trusted websites when it comes to providing timely and reliable information in any board or eligibility examinations conducted by Professional Regulation Commission (PRC), Supreme Court of the Philippines (SC), Civil Service Commission (CSC), among others. For fast updates, you may visit SC official website or follow us at our social media pages via Facebook and Twitter.